Ahead you will find ten super easy projects that need less than 30 minutes to be done (some need even 5!) and just few materials and tools – we’re pretty sure that most of them you have at home. Scroll along to see what we picked for you, we hope you’ll enjoy it. This literally takes less than 5 minutes to make it! All you need to have for this project is fruit and a cake stand. Use just a little bit of creativity while arranging the fruit – the more, the better. Use nuts, grapes, apples, pumpkins – anything you already have in kitchen, just put it together and you’re done. 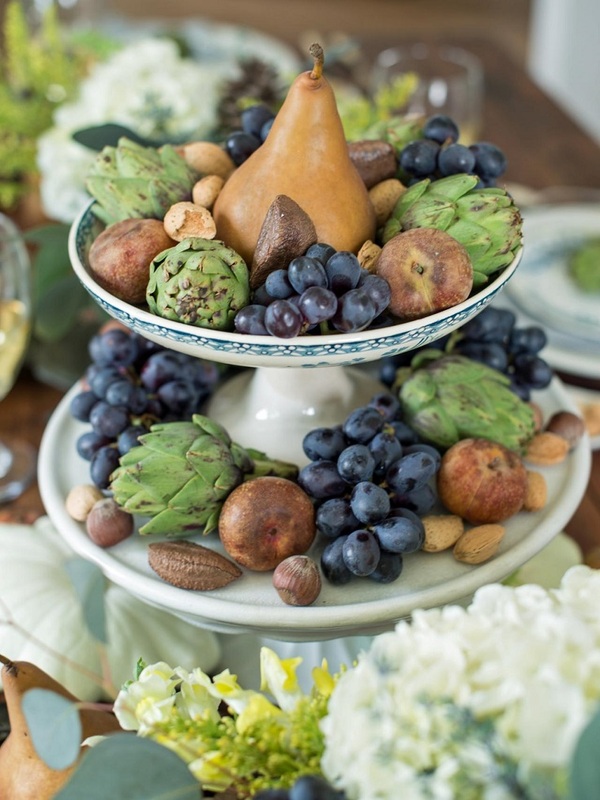 Here’s another example on using fruit as a centerpiece, except that this time it’s not only that, but there are also pinecones, antlers, snips of berries and florals. 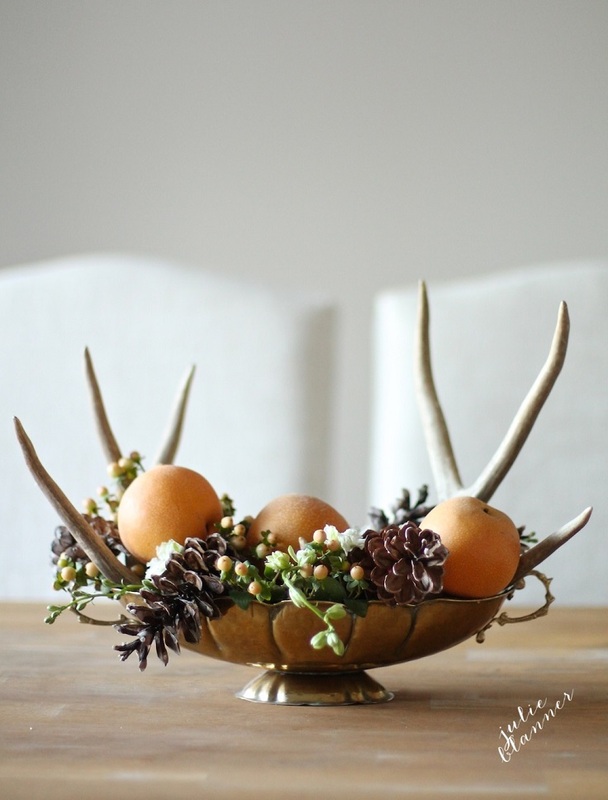 Choose what is going to be your base – in this case, that are the antlers and then go on with the pinecones, the fruit and the rest of the details. 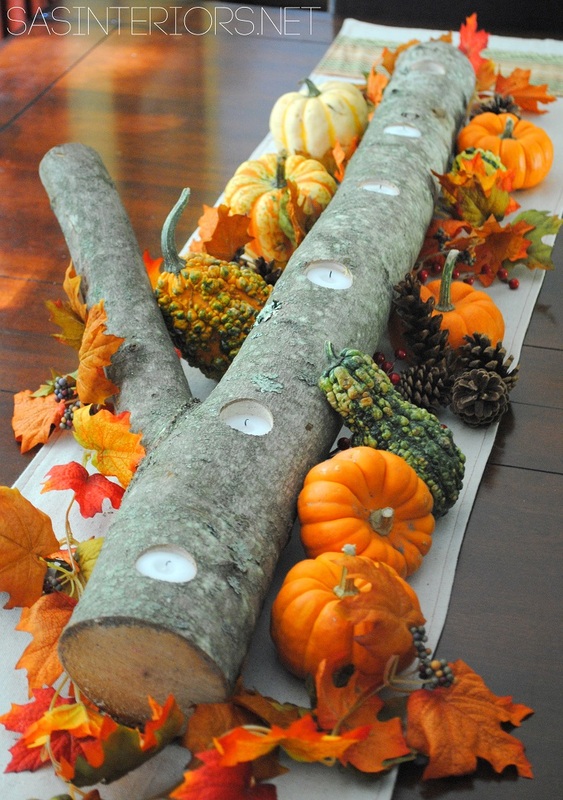 It’s really simple to make it and it’s a great way to invite Autumn in your home. Speaking of Autumn, let’s take advantage of this wonderful season while we still can. Soon it will be all about Christmas spirit and it will replace all things pumpkin and orange leaves theme. So, to experience a little more of the season you can pick few things and come up with a table centerpiece such as this one. You need a tree branch (and if you manage to drill it like the one on the picture, it will be a great candle holder!) 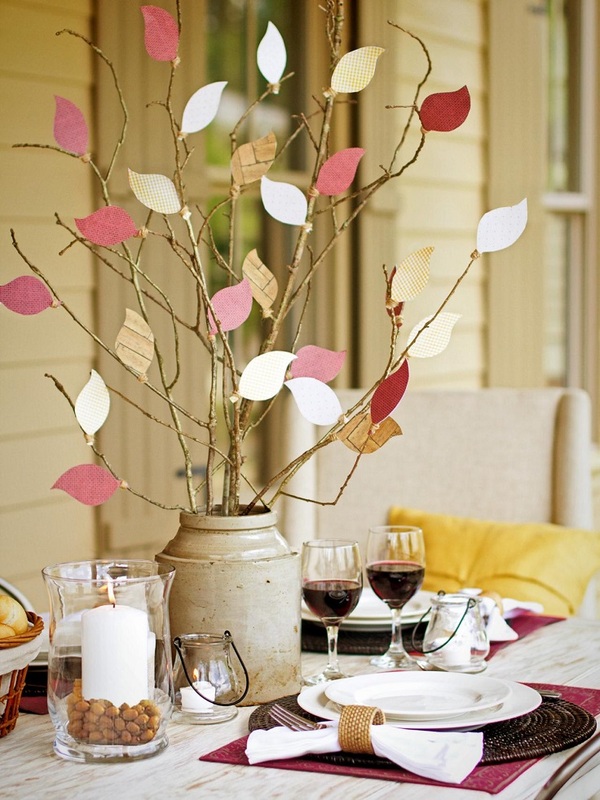 and details to surround it with, such as leaves, mini pumpkins and pinecones. Besides being super tasty, pumpkins can actually serve you as a vase and it will look so nice! 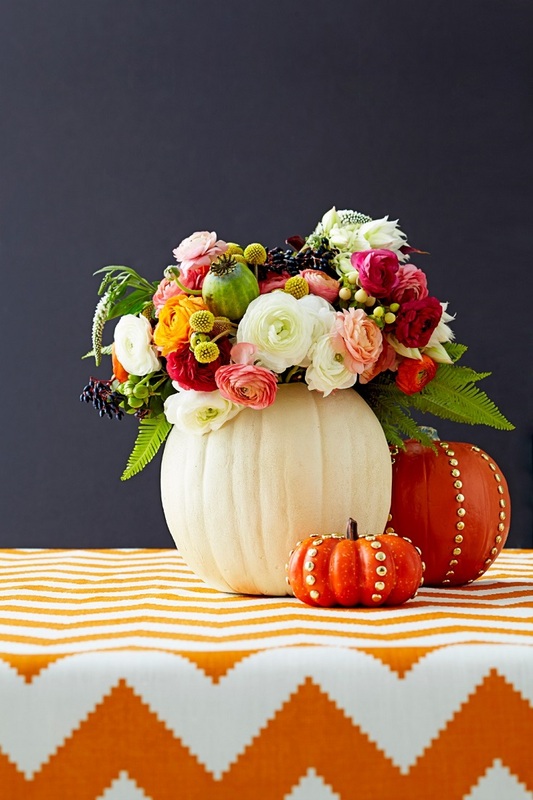 This kind of project bring some rustic vibes to the table and in order to have your own vase, you need a hollow pumpkin and flowers in a water-filled vase that will fit inside the pumpkin. It’s super easy and it’s done in no time! This fake leaves tree is really easy to make and it’s an example of how you can do great stuff with small budget. For this project, you need thin fallen branches, scissors, twine, variety of fall-colored, double-sided scrapbook paper, pencil, hot glue gun and glue sticks, gold glitter spray and vessel or vase of your choice. You can come up with your own leaf template, or you can check out the link below the picture where you can download a template for free. Writing down or printing the menu isn’t the only option you have. 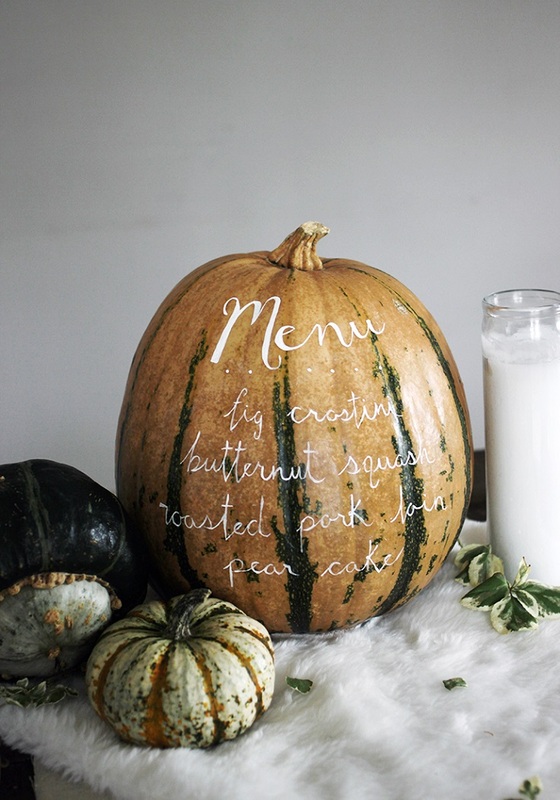 In fact, this option that we are showing you is way more creative and unique – have you ever thought about writing the menu on a pumpkin? This is a really low budget project, as all you need is a pumpkin, a small paint brush and some paint. The rest you already know – even possessing the most basic DIY skills will be enough! 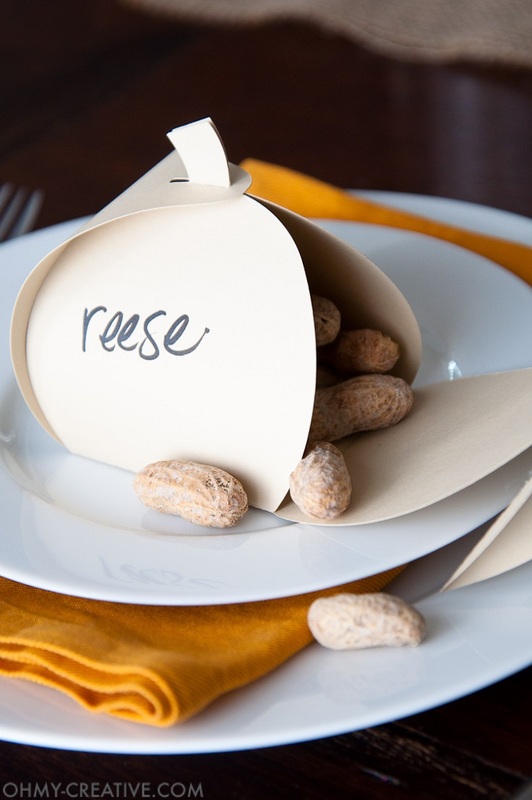 Thanksgiving place cards are nothing new, but there are so many ways that you can create and decorate one, so it’s never boring to use them as a table centerpiece. A leaf, a burlap and a little gold glitter are able to make wonderful cards! For this project, you need burlap, card stock, white sharpie, mini clothespin, glue or Mod Podge, paint brush and glitter. Here’s another pumpkin – inspired table centerpiece and this time it’s not about a real pumpkin, but for one made out of paper. Don’t worry – you can download the template for free from the website below the picture. You’ll need an electronic cutting machine for the best results, but you can try scissors or x-acto knife as well. Besides that, you need glue, floral wire, pencil and a sharpie. Of course, it would be such a pitty to talk about table centerpieces and not mention at least one including mason jars. It’s always amazing how can a glass, old and used jar turn out as an adorable home decor. 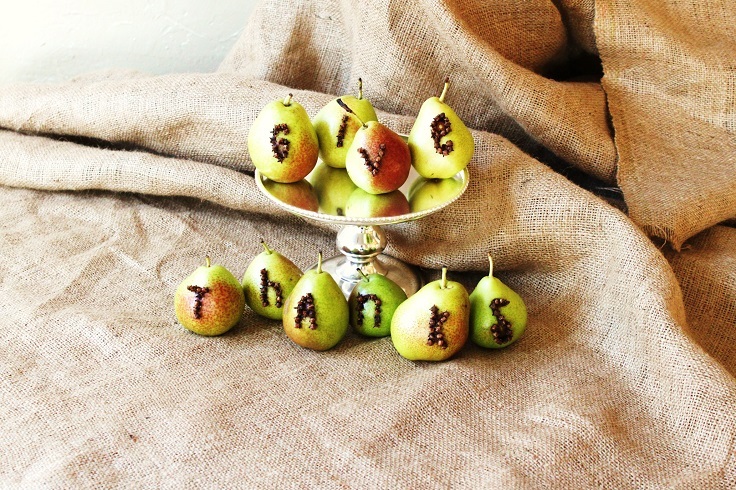 If you want to make a jar decor for Thanksgiving, give it a try like the one from the picture. 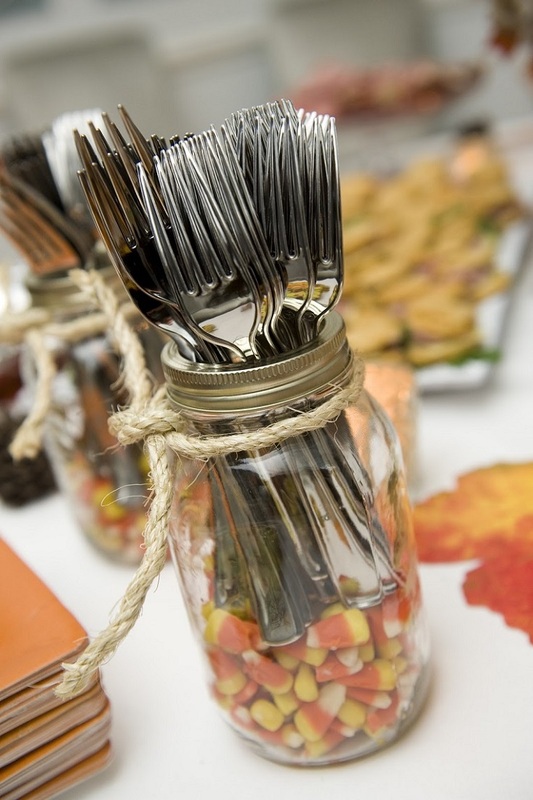 Use the jar as holder and fill it inside with candy corn. Add a ribbon around and it and voila. Sending out a message on Thanksgiving is really sweet. You can choose the cards for that, or be more creative and use pears! It might sound as not the best idea, but it’s definitely worth it. All you need besides the pears are white cloves. Note that it’s best to prepare the pears is a day before Thanksgiving. Arrange them around the table and that’s it!